Enviro-Fest 2008 unfolds beautifully under the sun! 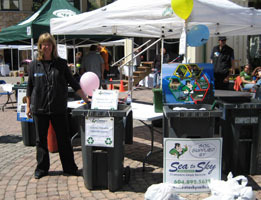 Enviro-Fest is a festival where local residents and guests can learn about environmentally friendly choices offered in the community in a fun and interactive manner. 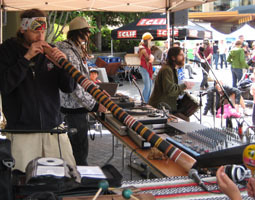 With humble beginnings in 2002, the festival started as a way to celebrate the Whistler business community's achievements in protecting our environment and moving toward sustainability. 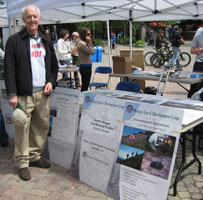 In 2008, Hilltrip was selected by the Resort Municipality of Whistler (RMOW) to organize the celebration. 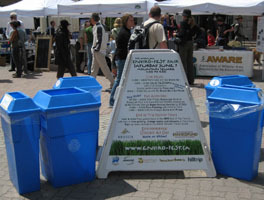 Packed with fun-filled activities to keep people excited about the various environmental activities happening in and around Whistler, the 7th Enviro-Fest spanned over three days to include the Gaia Gala, the Enviro-Fest Fair, and the Energy Film Festival featuring AWARE's Whistler Environmental Business (WEB) Awards. Starting with the Gaia Gala at MY Millennium Place on Friday, June 6, energy was felt by the attendees as they heard Bruce Sanguin speak about how global warming is the middle of a spiritual crisis and is offering the opportunity for everyone to "be the change." The audience also experienced Toby Beaulieu's multimedia show entitled "The Out of the Box Experience" featuring live guitar, vocals, drums, dancers and inspirational projection. 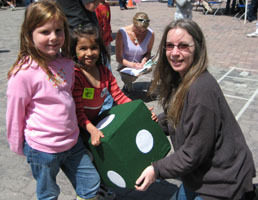 On Saturday, June 7, hundreds of people came to the Enviro-Fest Fair as the sun warmed the day. 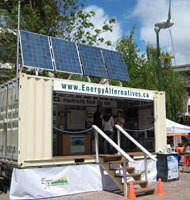 Located in Mountain Square, the outdoor event had over 30 organizations participating including a great demo trailer with solar energy devices set up by Alternative Energies. 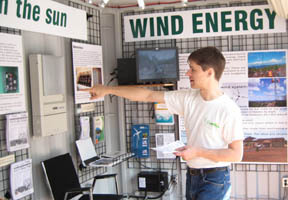 Featuring everything from sustainable food choices, to wildlife and nature, to energy savings, to health and beauty, to waste reduction, while at the same time providing some ear-pleasing live beats, the fair offered something for everyone to enjoy. Highlights of this year's entertainment included live music sets with DJ Bruno Be and Phroh, and a jam session with Papa Josh accompanied by Bruno with his didgeridoo. 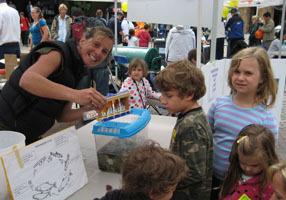 For those looking for fun activities, the third annual Wild Things Scavenger Hunt with local AWARE Naturalist Cara Richard, the human size climate change board game with BCSEA and the face painting with Peak to Party were well attended by the kids. 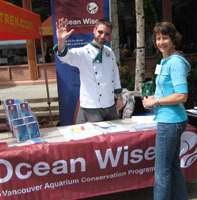 The festival ended with the 2nd Energy Film Festival and AWARE's 3rd Whistler Environmental Business (WEB) Awards at Millennium Place on Sunday, June 8. With seven documentaries, Q&A sessions, a panel discussion on clean energy facilitated by William Roberts of the Whistler Forum and energy alternative displays, the film festival raised awareness on global warming and sustainable energy topics in order to inspire participants to take actions that reduce greenhouse gas emissions. Hosted by Jessica Hare, the event raised essential questions about how much energy we use, how we produce it and how much it is costing us beyond the monthly utility bills. 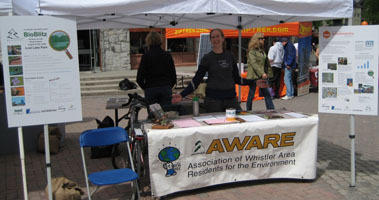 In an effort to recognize those businesses within the community whose voluntary, local environmental initiatives contribute to the protection, preservation, and enhancement of our environment, AWARE was proud to present its 3rd Whistler Environmental Business (WEB) Awards. Three local businesses were given much deserved recognition: Across the Creek Organics, Ziptrek Ecotours, and the Westin Resort and Spa who beat out some tough competition in the small, medium, and large business categories, respectively. 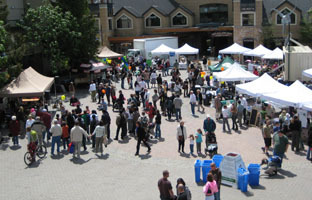 Thanks to everyone who came to Enviro-Fest and to the following supporters: Resort Municipality of Whistler (RMOW), Association of Whistler Area Residents for the Environment (AWARE), Community Foundation of Whistler (CFOW), Sierra Club, Energy Alternatives, Western GeoPower Corporation, Nesters Market, The Question, HappyFrog.org, MountainFM, Resort TV, Pique Newsmagazine, Sabre Rentals, Rocky Mountain Production Services and Peak to Party Co.
Enviro-Fest 2008 would have not been possible without you! 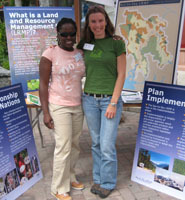 Hilltrip is proud to be working at creating an amazing environmental festival in 2009. 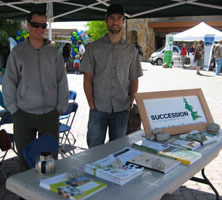 Scheduled to happen in the last week of May, Enviro-Fest will coincide with Whistler Wellness Week and will have a full week of activities including the 8th Enviro-Fest Fair on Sunday, May 31st. 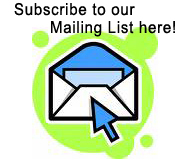 - The Tyee - British Columbia's online source for News, Views, and Culture, published weekdays. - Rabble - Canadian-based news, analysis and comment from progressive perspective.